Robots long ago earned a place in factories, where their steel welding arms help manufacture everything from cars to planes. Now, they are coming to the construction site. In recent months, a raft of companies have come out with construction-oriented robots or machines that were the stuff of science-fiction not long ago. Below, we bring together four of the most exciting robot technologies that are on track to terminate traditional tradie jobs such as bricklayer, paver, and concreter. For 6,000 years, bricklaying has remained largely the same - it still relies on slow, methodical placement of bricks by humans. But now, a new machine is threatening to change all that. Called Hadrian after Hadrian’s Wall in England, it can lay 1,000 bricks an hour and work around the clock. 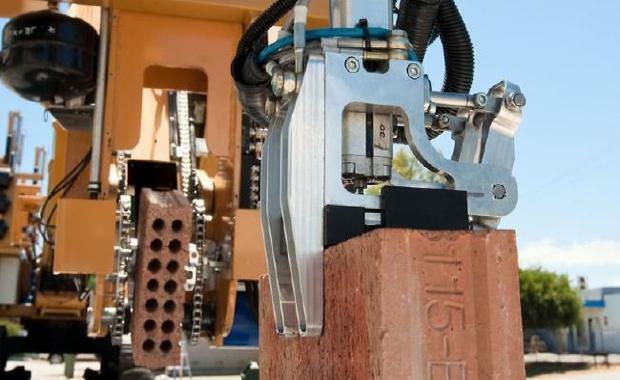 Its maker, West Australian company Fastbrick Robots, claims it could build 150 homes a year. The robot has a 28 metre boom that is connected to its main body with a a robotic ‘hand’ at the end. The hand can grab bricks, pick them up, and place them down in sequence. A 3D computer-aided design (CAD) is used to work out the shape of the house or structure required, and the robot then calculates where each brick should go. Mortar or adhesive is also deliver under pressure to the hand of the arm and applied to the brick, so no external human element is required. It can even leave spaces for wiring and plumbing, and scans and cuts the bricks if they need to be re-shaped. The project, 10 years in the making and with $7 million spent on it so far, has built a robot that can create a house in just two days. US firm Construction Robotics will launch commercial production of its Semi-Automated Masonry (SAM) robotic system this year. The device, which is smaller and has a more limited scope that Hadrian, is an automated bricklaying system that helps masons by doing much of the lifting and placing of bricks. SAM can lay about 230 bricks per hour, whereas the typical brick mason lays around 300 to 500 per day. SAM is transported from site to site in a trailer towed behind a ute. Companies purchasing the device will be able to send masons to a one-week training course that will teach them all the skills they need to effectively operate it. SAM is best suited for work on lengthy brick walls. With a price tag of $650,000, large masonry firms are currently the best fit for the device. Like building a brick wall, laying down paving bricks is back-breaking, time-consuming work. To make it easier Henk van Kuijk, director of Dutch industrial company Vanku, has invented the Tiger Stone paving machine. The road-wide device is fed loose bricks, and lays them out onto the road as it slowly moves along. A quick going-over with a tamper, and the brick road is complete. One to three human operators stand on the platform of the Tiger Stone, and move loose bricks by hand from its hopper to its sloping “pusher” slot – the bricks do have to be fed into the pusher in the desired finished pattern. From there, gravity causes them to slide together, in one road-wide sheet, down onto the sand. According to Vanku, a machine with two operators can pave at least 300 square metres of road per day, whereas a single conventional paver on their hands and knees manages between 75 and 100. Without a doubt the technology with the biggest potential to disrupt the building industry is 3D printing. Around the world there is a race going on to see who can make it commercially viable to build the structure of a house using just a 3D printer. The process of wielding 3D printers to make homes is in its infancy today, but someday soon you may look out your window at a large-scale printer, swiftly spitting out a whole home under the instruction of just one operator. Already, Chinese company Shanghai WinSun Decoration Design Engineering Co, claims to have built freestanding homes and an apartment block using 3D printing. While its speeds were impressive, their technique is one of prefabrication in a factory before assembly onsite so it doesn’t represent the true Holy Grail of 3D printing onsite. WinSun estimates that 3D printing technology can save between 30 and 60 percent of building materials and shortens production times by 50 to even 70 per cent, while decreasing labour costs by 50 up to even 80 per cent. Winsun Apartment Block[/caption] Winsun House[/caption]Future applications include 3D printed bridges or tall office buildings that can be built right on site. In the not-too-distant future, building a new home may be as simple as printing it out. Meanwhile, other developers continue to work on 3D printing solutions which will simply involved bringing the printer to the site and having it print the home right there with no assembly. One of the leading companies working on scaling 3D-printed homes for the masses is US firm Contour Crafting which won the grand prize in a NASA magazine's Create the Future contest. The 3-D printer contains the building material, which in the case of large-scale printing can be plastic or cement. The material is liquefied within the printer, and layer by layer the printer follows a path until the object in the 3D digital design is completely constructed. The layers build upon one another and solidify as they cool. It's really not as crazy as it sounds. There are 3D printers making dishes, building furniture and repairing appliances right now. But a home just needs a much bigger printer.